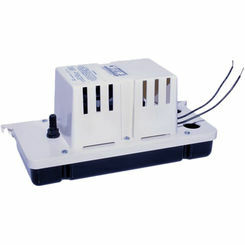 We carry a wide selection of discount condensate pumps. This device moves and directs the flow of waste water produced in HVAC applications, like boilers, furnaces, and air conditioning systems. Also known as condensate removal pumps, they are pumps designed specifically for removing condensation produced from the latent water vapor. Condensate pumps can actually help you to reduce fuel and energy costs saving you money in the long run. 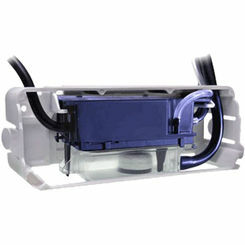 Buy Grundfos, Taco, Liberty, or Little Giant condensate pumps and pump parts. 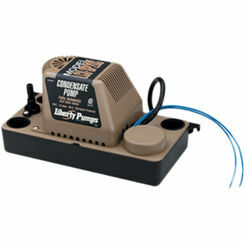 How Do Condensate Removal Pumps Work? A simplified way of putting it is that they are fancy dehumidifiers. The water vapor produced by these devices escapes the system through a steam trap and collects in the pump body or bowl. Eventually the tank where the condensation accumulates will fill and when the water level hits a certain height a switch is hit causing it to activate. It then empties until the level of the liquid is significantly lowered. In certain condensate pumps there are two switches. The first triggers the pump to start and then the other triggers if the liquid continues to rise indicating that something is wrong within the pump. 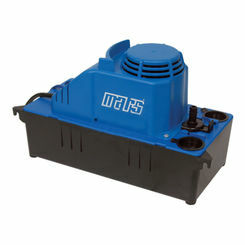 Typically these pumps are electrically powered centrifugal pumps. A centrifugal pump is a rotodynamic pump that uses a rotating impeller to increase the pressure and flow rate of the fluid. 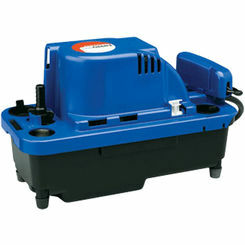 Condensate removal pumps can be used in any home or commercial building. 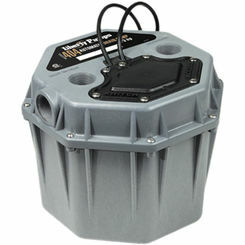 These pumps come in a variety of different sizes, normally they are rather small but when it concerns commercial buildings they can range up to sizes where the electric motor is so big it is actually separate from the pump body. 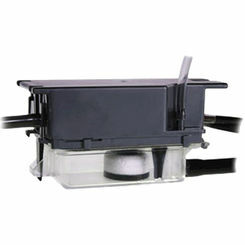 Some use the condensate pump as a feedwater pump (used to put feedwater into a steam boiler) to return the condensation under pressure to the boiler. Some industrial steam systems use the condensate pump to transfer the steam to another area in the factory, turning it into hot water then the water gets moved back to the make-up tank, be chemically treated and reused in the boiler, this is also known as the return pump. This water can be very dirty, and contain contaminants. You may even have acidic condensate, depending on the appliance. You may want to consider draining your pump into the sewer for this reason. When it comes to choosing an automatic condensate removal pump there are a lot of factors one must take into consideration, for example the first thing you need to do is choose the pump size that matches the size of the heating or cooling system. 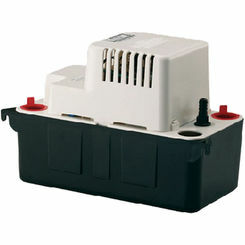 The pump should also be matched to the location, and should be capable of safely expelling condensation. Certain types of condensation may require special pumps that can deal with the minerals and other by-products found in condensation. With so many things to take into consideration it can be overwhelming and difficult to know which one is right. Here at PlumbersStock.com we are dedicated to helping you find exactly what you need, so please don’t hesitate to call our team at 435-868-4020.